7 Creative Ways to Declutter Sentimental Items- Without Throwing it Away! One of the hardest parts about decluttering is dealing with sentimental items. You see, decluttering can seem really easy when you’re sorting through things like old socks and stained tupperware. But then you come across something sentimental, and all progress stops because you simply don’t know what to do with the item. You pick up the item and it sparks a memory. Maybe it was given to you by a beloved relative who has passed away. Maybe it’s something you bought on a special trip. Maybe it’s a family heirloom. Whatever the case may be, when you’re trying to declutter sentimental items, it’s really easy for them to derail your decluttering progress. 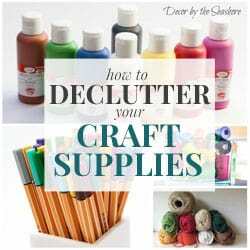 Don’t get sidetracked by sentimental clutter! 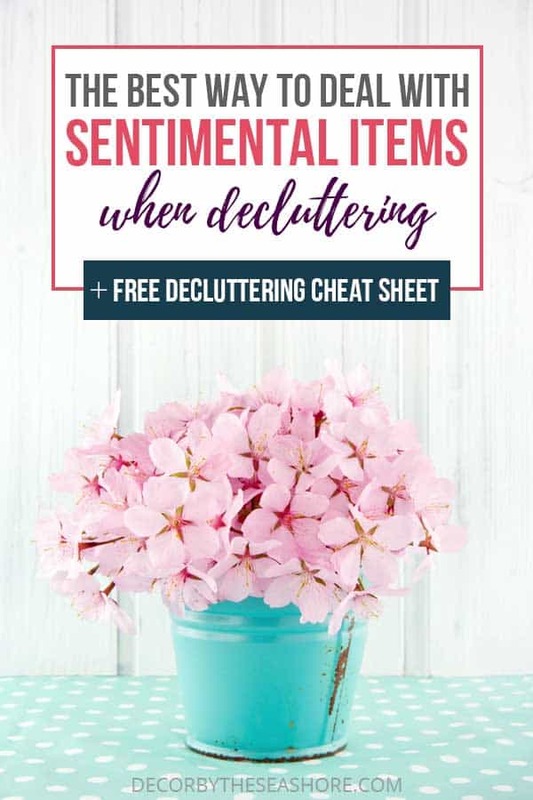 Grab your free sentimental decluttering cheat sheet below. This tool will help you make those difficult decisions and keep you focused while you’re decluttering sentimental items. But your decluttering journey doesn’t need to come to a halt simply because you don’t know what to do with these items. There are a few ways to deal with these items that don’t involve tossing them in the trash. HELPFUL HINT: Want to make some serious decluttering progress? 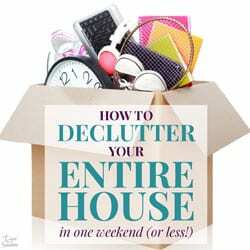 Learn how to declutter your entire home in just ONE weekend! 1. 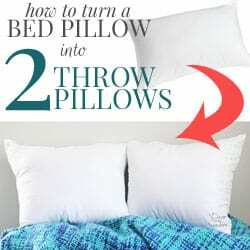 Repurpose the item into something usable again. When you repurpose items, you give them new life and meaning. 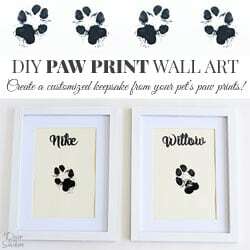 This is a wonderful way to keep the item and turn it into something you can use around the home. For example, a pile of old t-shirts can be turned into a t-shirt quilt. An old wedding dress can be repurposed into a baby gown. If you have a sentimental piece of clothing, repurpose it into a pillow or stuffed animal. 2. Display items around the home. If the item is something you truly love and can’t part with, consider displaying it as a decoration somewhere. Bring the item out into the open for everyone to enjoy instead of being forgotten about in a box somewhere. Frame your kids’ artwork, or put that family heirloom on display on the mantel. Everyone will be able to see and enjoy the item on a regular basis. 3. Keep one item from a collection or piece of something large. Instead of keeping an entire collection of items, choose one or two that are your very favorite or have a strong memory attached to them. For example, instead of keeping an entire collection of dolls, just keep one or two favorites that are special to you. HELPFUL HINT: If you’re short on time, see how you can declutter your entire home in just 30 minutes a day! 4. Find a use for the items around the home. Instead of keeping things stored away in boxes for “someday,” pull them out and use them now. It’s not worth keeping boxes and bins of sentimental items you’ll never look at. Those memories are just packed away in boxes, never to be seen. Put those things to good use. The fancy china and special tea towels deserve to be used more than once a year! 5. Give every family member their own special keepsake box. Let family members put whatever sentimental items they want into their special box. Once the box is full, they’ll need to get rid of something if they want to add more things to it. This is especially helpful for people who attach meaning to every little thing. 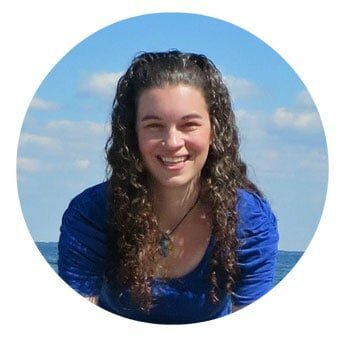 Giving them the box and setting a limit makes them prioritize what is actually meaningful. For example, does an old, holey sock you wore on vacation hold the same meaning as a quilt made by your grandmother? Probably not! 6. Digitize old photos and documents. An easy way to downsize old photos and documents is to scan them and keep digital copies. That way you’ll still be able to look through the photos, but you won’t have to take up space storing physical copies. If you wish, you can keep and frame a few favorites. Then get rid of the rest once they’re digitized. This not only will help decrease clutter around the home, but it will make these things easier to share and help preserve them for generations to come. HELPFUL HINT: Drowning in paper clutter? Follow these 6 steps to tackle that paper clutter once and for all! If there’s something you don’t really want to keep but you still want to remember, take a picture. You’ll be able to look back at the picture and remember the item without it taking up space in your home. 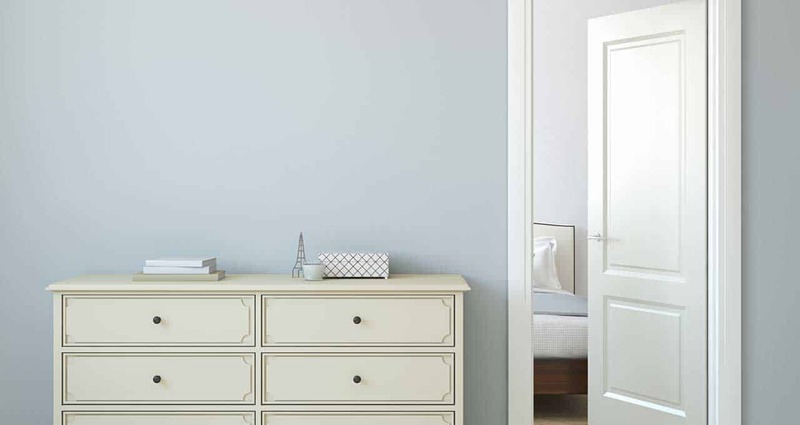 Psst… want an easy way to remember these decluttering tips? Get the free cheat sheet below! If you’re still stuck trying to declutter sentimental items, try putting them aside and move on to a different area of your home. Choose a room that doesn’t have many sentimental items, such as a bathroom or the kitchen. Once you start making decluttering progress and get things moving along, it becomes easier to make those decisions and go through things that have more meaning. Don’t forget… letting go of physical possessions doesn’t mean you’re letting go of the memories! Often times we cling to items because we associate them with a memory. We’re worried that we’ll lose that memory if we get rid of the item. 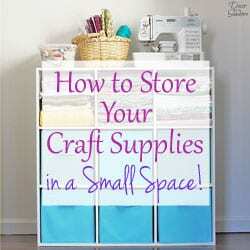 HELPFUL HINT: Tired of battling clutter? These 8 habits are essential for keeping your home clutter free! ​It’s easy to associate a memory with an object. But just because you get rid of an item does not mean you’ll lose the memories that go along with it! If you’re holding onto items because you’re worried you’ll lose those memories, you’re letting your possessions control you. You’re letting them hold power over you. And that is the LAST thing you want. Decluttering and getting rid of things won’t get rid of the memories. But decluttering can make your home a more enjoyable place to live. Decluttering can help you feel less stressed and overwhelmed. Decluttering can mean you won’t have to waste valuable time cleaning up stuff you really don’t need or use. 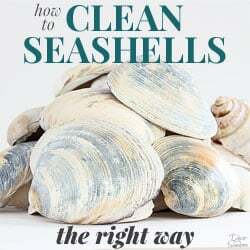 I don’t know about you, but that makes the decluttering 100% worthwhile, no matter how hard it gets. And I’m going to let you in on a little secret… many times you’ll find that you don’t even miss the items when they’re gone. I truly hope this helps you sort through those sentimental items that are a little more challenging. Because let me tell you, the benefits of decluttering your home are SO worth it! You’d be amazed how much easier it is to run a home when there’s so much less stuff weighing you (and your family) down. If you enjoyed this post, check out the links below for more ways to simplify your home.